These services are included in your monthly residential waste collection service at no additional charge. Residents receive 12 extra service stickers per year for free pick up of extra garbage, recycling or green waste when needed. Use these any time you have trash, recycling or green waste that will not fit into your carts. Simply place the extra material in a 30-gallon plastic bag and attach the sticker to the bag. Make sure the sticker faces the street, so the driver can see it. - Once the 12 extra service stickers have been used, additional service is available at a nominal cost. - Extra service stickers are mailed directly to the service address each December. - The new set of stickers may be used January 1 through December 31 of the following year. 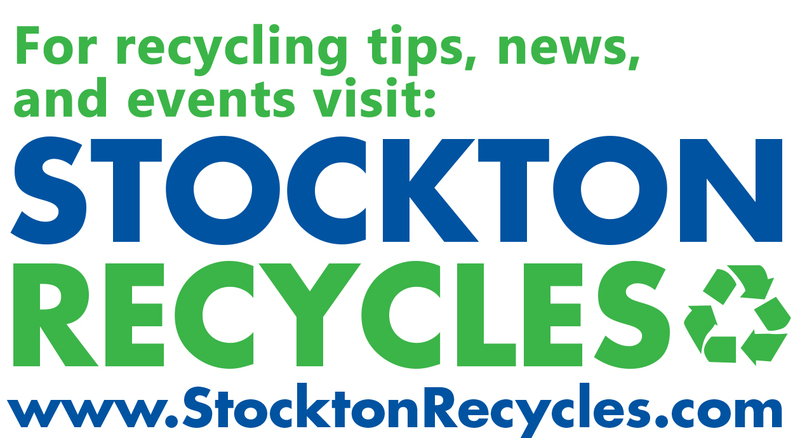 Residents have one opportunity each year to dispose of unwanted solid waste and recycle items free of charge during the neighborhood clean-up program "Stockton Clean Sweep". For more information on this program, visit the Clean Sweep web page. Your service provider will collect used motor oil and filters during weekly curbside collection. Special handling is required. Your service provider will properly dispose of both the motor oil and filters. Used motor oil must be in a clear plastic jug with screw on lid taped in place. Used oil filters must be drained and sealed in clear plastic bags. Then place these items on the ground, next to your recycle cart for collection on your regular service day. Residents may also dispose of used oil and oil filters at San Joaquin County's Household Hazardous Waste Facility. To learn more about this facility, visit the Household Hazardous Waste web page. Residents can safely dispose of used household batteries (AAA, AA, C, and D) via their curbside waste collection system. Seal batteries in clear plastic bags and place on top of the recycling cart. Residents may also dispose of used batteries at San Joaquin County's Household Hazardous Waste Facility. To learn more about this facility, visit the Household Hazardous Waste web page. Residential areas will be swept every other week the day following your waste collection day. Sweeping will occur between the hours of 4 a.m. and 5 p.m. Remember, vehicles parked on the street, low-hanging branches or other impediments prohibit sweepers from cleaning streets and gutters. Residents are encouraged to remove vehicles and any other obstacles from the streets on sweeping days. During Leaf Season – Oct. 1 to Dec. 31 only – your service provider will collect up to five bags of extra leaves per week at no additional charge. Visit the Seasonal Leaf Collection web page to learn more. Between Dec. 26 and Jan. 15, place your Christmas tree next to your cart for collection. Your service provider will remove the Christmas tree to be properly recycled. Remove all tinsel, ornaments and metal stands from the trees. If your tree is longer than six feet, it must be cut in half to be collected. Flocked or fireproofed trees may be placed at curbside for collection but cannot be recycled. After Jan. 15, cut your tree up and put it in your green waste cart for removal.